Heat the lard in a large Dutch oven or heavy casserole over medium-high heat. Season the meat with 2 teaspoons of the salt and the black pepper. Once the lard has melted, add the meat, brown on all sides, stirring and flipping as it does, for about 10 to 12 minutes. In the jar of a blender, pour 1 ½ cups of the milk and add the garlic, onion and remaining 2 teaspoons of salt. Puree until smooth. Pour over the meat and let it come to a simmer, then reduce heat to medium-low, drop in the bay leaves, and cover. Cook covered for 1 hour and 15 minutes, flipping the chunks of meat a couple times in between. In a small bowl, combine the remaining ½ cup milk with the sugar. Pour over the carnitas, stir, and let them continue to cook, uncovered, for another 4 to 5 minutes. Turn off the heat. With a slotted spoon, remove the meat and place in a bowl. Shred with a couple forks, add a couple tablespoons of the seasoned fat remaining in the casserole and toss. Gotta try it tonight. Will advise result. Love ❤️ the show. Keep going. Looking forward to hearing how you liked it, Ralph. These were so delicious and easy Pati! Thank you for demystifying Carnitas for me. I typically only eat them when I’m visiting home in Texas. Now I can make them at home in MD. My boys ate them all up. They loved them! So happy to hear that your boys ate them up, Amber! Hello Paty! I am from Michoacan where you can get the BEST carnitas in the world! But I saw your show and I can’t wait to make them! Thank you for the show! Oh I hope you love these carnitas, Jose! Can you substitute milk with coconut milk? Lactose and nut allergies in this household. Go for it, Pauline! 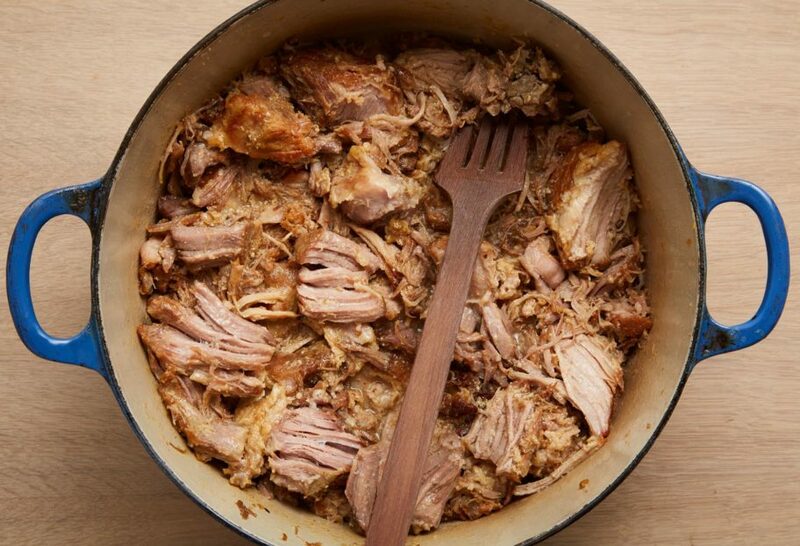 You can also use this recipe: https://patijinich.com/recipe/brown-sugar-carnitas/ and replace the sweetened condensed milk with with a tablespoon of brown sugar. I usually make crispy Carnitas, but I have wanted to try the “softer” version this time. I used your recipe last night and they turned out really good! I wasn’t sure about the brown sugar but it added a really good flavor to it. I think next time I might add orange juice to give it a little bit more acid. Thank you for the recipe! I am making these in honor/memory of my sweet Mama who was such a fan of this show. I know she would of loved these carnitas! It’ll definitely be bittersweet when we sit down to enjoy them. What a wonderful way to remember your mom Elaina. Hugs! Just made these today. I had the same issue with way too much liquid left after the allotted cooking time. Tried cooking it for another half-hour, to no avail, but finally just spooned off most of the excess before adding the final blend of milk and brown sugar, and voila (or whatever the Spanish equivalent would be…), it all carmelized nicely – and tastes fabulous! I’m glad you enjoyed the carnitas, Bob! Just made these. They were amazing!! This was the way mi abuela made hers. Brought back so many great memories of visiting her I’m Tijuana. They were so tender and juicy. And the flavor is to die for. Love you and your show so much. Thanks for the recipe. So happy that it brought back such good memories, Jaime! It’s ok if there is more liquid in the pot, Kathy. You can just remove the carnitas with a slotted spoon. I am making these right now. Had a bit of a problem getting the meat to brown. It never did. Then the milk broke and it looks more like ricotta cheese. What did I do wrong? I loved that show and was so stoked to make this dish. Fee foolish. Oh I’m sorry to hear you had some problems, Constance. When the milk heats the hot lard, it appears as curdled, but it really is not. I hope you give the carnitas another go. Making this amazing looking carnitas this weekend for the in-laws visit. Can’t wait! Have a super yum meal with your in-laws, Cesar! this is the best cooking show ever made! Oh wow…thank you so much Hank! So glad you found a new tip, Lisa. Enjoy the carnitas. Can I substitute beef for pork? Oh give it a go, Danita…I usually make it with pork but beef should be good too. I use condensed milk! I am trying these this week! Thanks! Have fun making them this week, Elizabeth! OMG, Juju is so big! It must be all the good food 🙂 . Can’t wait to try this carnitas. I loved this episode! Thank you Pati! Also, would this recipe work in a slow cooker? Yes it will work in a slow cooker, Camille…enjoy! This is delicious, Reminded me of my tio’s Juan’s cooking and the only thing I added was an orange to the milk and brown sugar and blended it and then cooked it in the last step, just as my tio Juan would have. Buen provecho ! I’m glad you made the carnitas your own, Becky…and that they reminded you of your uncle. My mouth has not stopped watering since watching this show! Oh I hope you get to make the carnitas soon, Linda!